On Jan 21st, Microsoft announced Windows 10, the next version of their operating system. 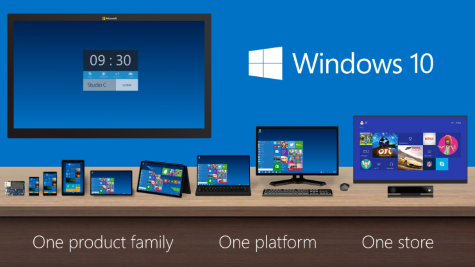 Windows 10 will be for all of the devices that Windows runs on — PCs, tablets, and phones. The image above shows the same UI being stretched across the entire range of Windows devices (including also Xbox and TVs). One thing that is certain is that Windows 10 will have universal apps — software that works across any device running Windows 10. However, specific details about Windows 10 are still sparse, and will likely be revealed in the spring. The big question I have is whether Windows 10 for phones will be running the full desktop version of Windows 10 (similar to how the Surface Pro 3 does now), or if it will be running a separate OS that just has the same UI (like Windows Phone 8) and works with some of the same apps. If it’s the former, then I can’t imagine some manufacturer won’t try to create a device that allows the phone to dock and work as a desktop computer. 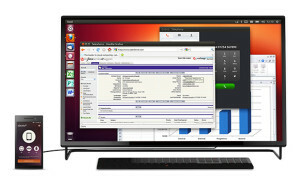 I got excited about Ubuntu for phones, because Canonical promised the phone would be running the full Ubuntu Linux OS, and even showed pictures of the docked phone running a computer (such as the picture on the right). They ran a crowdfunding project that was both the largest amount of money ever raised in the history of crowdfunding (over $12m) and unsuccessful. Despite this, they promised to release the software with a few manufacturing partners. The phone was supposed to launch in 2014, but it is behind schedule. The good news: they say it will be out in early 2015. However, when it is initially released, it will be without the features allowing for the phone to run the desktop OS — that has been pushed further into the future. My hope is that this will come sometime in 2015, but we will see how good the software is when the initial phones are released and how well they are reviewed. Both Windows 10 and Ubuntu are promising. Let’s see what 2015 brings! Fingers crossed that the phone, laptop, and desktop are all about to become one and the same.